Patrick writes a hell of a vicious critter story and these little guys are particularly nasty. 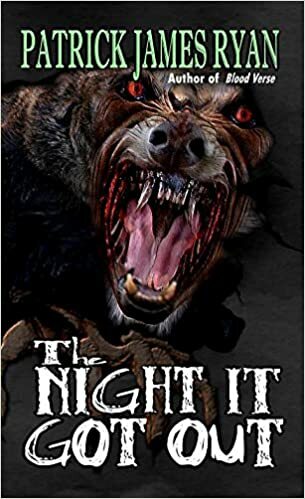 Don’t let the cover mislead you, this book has neither werewolves nor other creatures of were variety. The hybrid “monsters” in this chilling, gore packed novel are weapons research at its worst, the subjects of cross gene splicing (given a heavy cocktail of pills to increase their intelligence) spoon fed hate and then unleashed into the savage rain forests of Nam to “clean out” VC tunnels during the Vietnam War. Fast forward some 50 years later and the government has recovered its last remaining prize, last seen in those rain forests, and is quietly transporting it when disaster strikes and the transport wrecks and all hell (literally) breaks loose outside of a small town. Let the chaos and death count begin. The cover jumps out at you and foreshadows the promise of gore dripping pages of terror. Patrick has written a novel that delivers on this promise and is fueled by copious shots of Nitro. The action is fast and visceral, like a roller coaster ride. He takes the reader on a bumpy ride, full of gore, claws, and bullets. The characters are believable. This reader really enjoyed Elliot Harmon, though a bit more back story would have been nice. The emotional bond he had with the creatures he had a large part in creating is the solid backbone that pushes this story forward and forward it goes, pushing unrelentlessly and unstoppable like a roller coaster with lightning speed and hairpin curves. It reads like a summer blockbuster on speed. The other characters just didn’t have that same investment for me, but to each their own. If you enjoy gore and things that go bump in the night, pick up this blazer of a title.